Looking for a legitimate setting in which to let loose with a few kicks and punches? Kaju AZ Kickboxing is for you! This combination of martial arts, aerobic exercise and boxing offers a fun and appropriate way to blow off steam. Kickboxing can also help you feel great, get strong and even lose weight. Kajukenbo Arizona offers a powerful “one – two punch” in the health and fitness game. We offer an authentic full-body boxing workout that provides a new level of empowerment. Our 60-minute kickboxing classes will strengthen your body from head to toe and you will have fun doing it! To get better balance, power and agility, kickboxing is king among workouts. Experts who have studied the sport say nearly everyone—even older people who might shy away from such things—can benefit from throwing a punch. 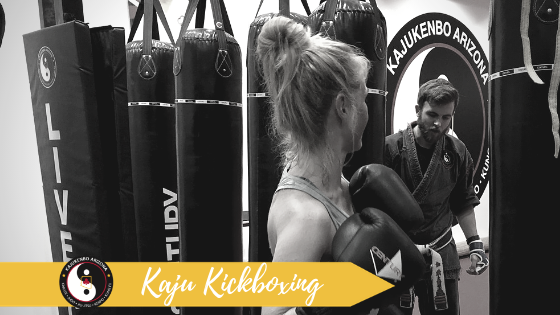 Kaju AZ offers traditional boxing fundamentals that develop confidence and strength and a self-defense mindset. Our highly-trained instructors will motivate you to kick and punch through our dynamic and challenging curriculum. Using our 100-pound heavy bags you will experience explosive boxing rounds where you will deliver jab, punch, hook, uppercut and elbow combinations that work your entire body and also prepares your mindset. Workouts include bag work, shadow boxing, cardio drills and stretches that will get your heart pumping. Boxing combinations, footwork drills and strategies give you the full kickboxing experience. Kaju AZ provides a positive, encouraging workout that will improve all areas of our life. Our kickboxing classes are appropriate for adults 15 and older of all skill levels. We offer a free trial and look forward to meeting you. Mention this blog post to receive a special introductory offer!